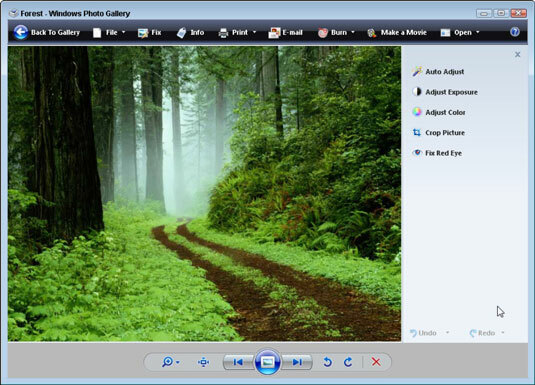 The Windows Photo Gallery provides several tools for improving your digital photos. You can use these tools to get rid of the red-eye effect, crop a photo, and adjusting color and brightness. Open the Windows Photo Gallery and display a photo. You can display a photo by locating it with the Navigation pane; then click the thumbnail to select it. The Fix window appears, showing the available tools on a pane on the right side of the window. Click Auto Adjust to let Photo Gallery fix the photo, or use one of the available tools. The expanded color adjustment tools. Adjust Exposure: Use the sliders to adjust brightness and contrast. Adjust Color: Use the sliders to adjust temperature, tint, and saturation. Crop Picture: Use the handles on the rectangle that appears to enlarge or shrink the area on the photo to be cropped, or click the rectangle and drag it around your picture to crop to another location on it. Click the Apply button to apply the cropping. When you click the Apply button, it applies and saves the change. Fix Red Eye: If your picture contains a face with red, glowing eyes, click the Fix Red Eye tool and then click and drag around the eye you want to fix in your image to adjust it. Use the navigation tools at the bottom to zoom in or out, fit the image to the window, move to the next image, undo or redo actions, or delete the picture. The Undo feature in this window allows you to pick the action you want to undo, unlike many Undo features that force you to undo all the actions leading back to the action you want to undo. Click the arrow on the Undo item under the tools, rather than on the set of buttons along the bottom, to use this feature. When you’re finished, click the Back to Gallery button. Or, if you’re finished reviewing your photos, you can simply click Close to close the Photo Gallery altogether. If you want to display your photos in a digital photo frame or using the Photos screen saver, you will quickly learn that pictures taken in portrait orientation look pretty silly as they pop up on your monitor or frame. You can use the rotate buttons at the bottom of the Windows Photo Gallery to indicate that these pictures should be viewed right side up. That information will be saved with the file so that they’ll always display properly.